Listen to an exclusive Voices from the Field interview with Patricia Mie Matsuo, PEN's Regional Coordinator for Brazil, below. My name is Patricia Mie Matsuo. I am the Regional Coordinator for Brazil, South America with the Primate Education Network. When I finished my studies, I planned to work as an educator, no matter what ecosystem or what species I would focus on. In 2000, I became a primate educator when I started to work at the Golden Lion Tamarin Association in Rio de Janeiro State, Brazil. When I visited the golden lion tamarins in the forest, I saw how special and smart these primates were and I realized why they were one of the symbols of conservation in Brazil. I coordinated the Golden Lion Tamarin Association’s teacher capacity-building program, Rediscovering the Atlantic Forest, for eight years. I identified many teachers that were born in the distribution area of the golden lion tamarins that had never seen this primate and did not know the importance of the local forest, The Atlantic Forest. 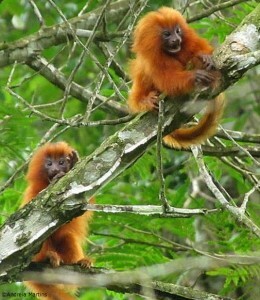 The teachers had the opportunity to observe the golden lion tamarins in the wild. With all the groups of teachers, I could see the happiness in their eyes. I’m sure it was an unforgettable moment in their lives. After this first contact with the golden lion tamarins and talks with primatologists, teachers started to plan and carry out activities about this endangered and endemic primate. They conducted activities such as research projects, drawings, posters, poetry, music, games, writing projects, interviews, exhibits, history projects, and outdoor activities. Teachers integrated conservation issues in subjects such as Mathematics, Portuguese, Geography, Art, Chemistry, Biology, and others. Teachers and students were learning about these animals, what they are, what they ate, where they lived, the Atlantic Forest, and the connection of this forest with human well-being. The main challenge for me has been guaranteed continuous support from the local government in conservation actions. In Brazil, we have elections over four years for Mayor and the Heads of the Departments, such as Education and Environment, usually chosen for political issues, not for technical skills. When it happens, educators must present the importance of the department’s support in conservation projects carried out in their municipality and reinitiate the relationship to guarantee the continuous support. If the head changes for any reason during the four years, educators have to give their presentations all over again. Once, I had to present the teacher training project I coordinated for three different heads that assumed the same position over the same year. It was exhausting, but a necessary thing to do. To overcome the challenge, we had to plan different strategies to guarantee the partnership, send invitations, ask them to participate in the workshop, organize a meeting with the teachers participating in the project, who would share their experience to the head. It’s continuous work for primate educators in Brazil. The actual education team of Golden Lion Tamarin Association realizes that they still have to be prepared for changes of Education Heads in Rio de Janeiro State. You recently led a PEN workshop in Brazil. How did the workshop help educators in your region? 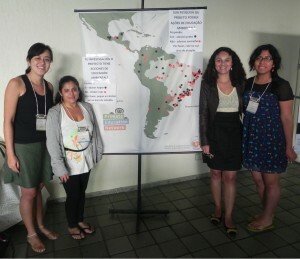 The workshop I led took place this month and was hosted at the Latin America and Brazilian Primatology Conference. It was the first PEN workshop in Brazil and Latin America. Xyomara and Aline, other PEN regional representatives, helped facilitate the workshop. Educators had the opportunity to better understand PEN’s mission, goals, and how we work together to address three needs: connections, resources, and services. They also learned from each other’s experiences and stories during our “Show & Tell” group activity. The group identified four needs: identification of educators, capacity building of educators, financial resources, and partnerships. From these needs, we created an Action Plan and they had some good proposals. For example, there are some Brazilian government funds that are not being used because there are not good proposals. During the workshop, each educator identified local government funds that could be used to support their primate education projects. Overall, the workshop revealed that Brazilian educators are working in different parts of Brazil, but we have the same needs. We identified how we can and should work together in creative and collaborative ways.